Without bee pollination, flowering plants would die out, which means no fruits, vegetables, or honey! 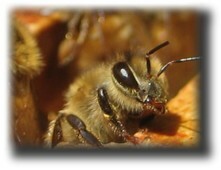 Of the 100 crops that provide most of the world’s food, over 70 are bee pollinated. List of bee pollinated crops. Honey bees have a complex kind of GPS. They find their way by using the sun, patterns of polarized light in the sky, their magnetic sense, memory of landmarks, and smell. The bee dance is ‘the second most complex language in the world’ (Prof. James Gould). A bee can communicate direction, distance, and quality of flowers — and all in the darkness of the hive! 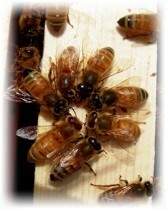 Bees are the only other creature we know of with a language of symbols. Bee dance-language explained (pdf). 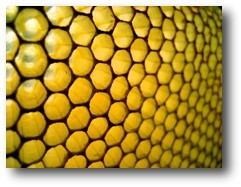 Bees build a honeycomb with their feet and mouths; perfect wax hexagons sloping at exactly 13˚ so the honey stays in. This movie shows how bees make honey – this was my first ‘hobby’ beehive and an old honey extractor. Honey bees can learn, count, tell time, measure, memorize, and make decisions (photo by Sarah Anderson). Note: honey bee is written as two words (not ‘honeybee’) because it’s a type of bee — just as ‘fruit fly’ is a fly but ‘dragonfly’ is not. Beautiful Pollinators: Wings Of Life movie preview.